We rose up to the challenge. We reached back to the panicked customer who as soon as Monday placed a rush verbal order for 5 each 92-element phased-array transducers packaged in custom housings for the UT testing machine - exactly fulfilling the requirements of the customer. We take our customers emergencies to heart, and early on have made it a point to be vertically integrated and keep inventory, personnel and the know-how in-house to fulfill special requirements such as this. We were able to fabricate three sets of transducers by Thursday PM. The customer was ecstatic to know that his precious transducer cargo was on its way to his bar mill so that his production could resume ASAP. The written confirming PO wasn’t received by our office until Friday morning, but people and customers matter more than documents. We knew our customer’s business was on the line and we couldn’t let their needs get stuck in paper shifting. It is times like this that we really enjoy being in this business. 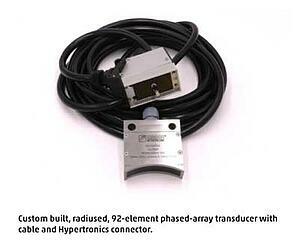 Customers have a need and should be able to source quality transducers quickly and efficiently. We’re proud that they trusted us with their business, and we were able to support them as needed.